When porting drivers on a specific board for a comparatively new linux kernel, it is common to edit the linux device tree files to put together all the device configurations with register values, working modes and pin control offsets set to expected values. Here in this post we focus on the exact steps one needs to find the correct pin control offset for specific devices. Here we'd take TI's AM4379 (AM437x) chip as an example for this tutorial. Before getting your hands dirty on editing your own device tree, you must get a glance on what device tree is and what it is for. There're some information available in eLinux Wiki (Device Tree Reference). Further, you might want the spec in hand where you may get it from Devicetree org's github repo. Here we use the SDK's kernel source tree, which pinned at Linux kernel 3.14 release. The SDK's kernel is edited and added the am437x-gp-evm devboard device tree which we'll start from here. skeleton.dtsi The bare minimum device tree. am4372.dtsi The AM4372 SoC Chip Device Tree. Should be included for all devboards that use AM437x chip. am437x-gp-evm.dts The example devboard model's device tree file from TI. Note: file am437x-gp-evm.dts is only available in SDK's kernel source tree, but not available from kernel archive. You may take the am437x-gp-evm model as a good starting point to port to your own AM4379 board which suits your needs. Let's take a quick glance on am4372.dtsi file. The purpose of the file is to define the capability of the SoC chip while most of the functionalities are disabled by default. Then, one should write a devboard model specific file which configures the devices in need which comes to the am437x-gp-evm.dts file. In this file, it re-enables some devices based on the actual board's functionalities. Note 1: There're also some other models based on AM437x SoC chip provided by TI including am437x-gp-easyevm.dts, am437x-gp-evm-captouch.dts, am437x-gp-evm-fpga-emmc.dts, am437x-gp-evm-fpga-nandflash.dts, am437x-gp-evm-hdmi.dts, am437x-sk-evm.dts, etc. They can also be reference starting point as well. Note 2: Also, most of the kernel source code (written in C) listed in the blog is for reference only. I do not encourage beginners to dig deep in. Since most of the functionalities one would like to edit is the GPIO (General Purpose Input Output) pins, let's first start off by turning off a LED on a board on boot. Aim: Turn off led D8 on boot by default. The default device tree configuration turns on all the user leds when the board boots. Let's take a look at the led circuits in the schematic diagram. 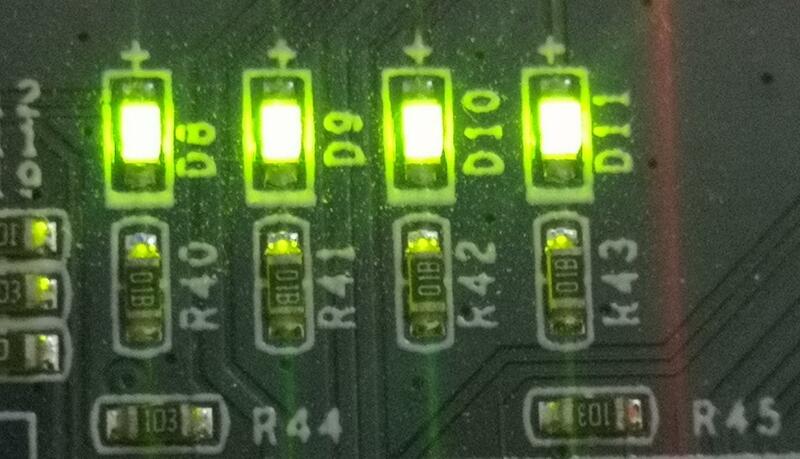 It shows that if you pull up the GPIO pin, the corresponding green led lightens, and vice versa. Therefore, we just need to setup GPIO5 to "pull down mode" to match our aim, aka. turning led D8 off. Let's collect some information available in device tree source files. The gpio5 definition in am4372.dtsi file shows the GPIO chip 6th definition (starting from 0). Its GPIO model is compatible with ti,omap4-gpio, which documentation is found at /Documentation/devicetree/bindings/gpio/gpio-omap.txt in the Linux source tree. Here, let me explain about some magic numbers appearing in the device tree source. The number 48322000 or 0x48322000 is the starting memory mapped address of GPIO5. Start address can be found in Table 2-3. L4_PER Peripheral Memory Map in TRM at P148. 0x1000 is the length of address space assigned to this device. The length can be calculated via End address - Start address. Also available at TRM P148. It specifies the interrupt type and can be found at /Documentation/devicetree/bindings/arm/gic.txt in the Linux source tree. GIC_SPI is shared processor interrupts interrupt type meaning that the interrupt might be processed by any of the SMP cores. IRQ_TYPE_LEVEL_HIGH is the interrupt flag detailed in the documentation. Currently IRQ_TYPE_LEVEL_HIGH shows that the interrupt is triggered at high level. 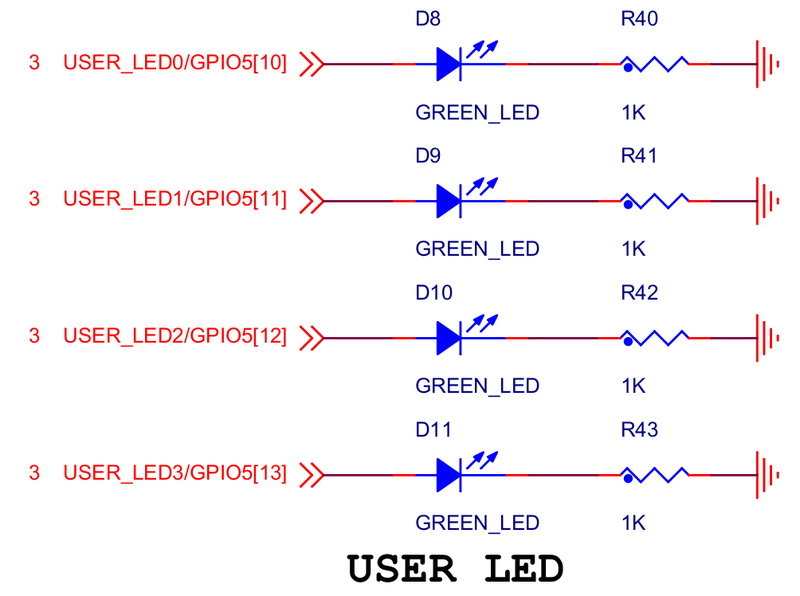 Further, let's take a look at the led definitions in am437x-gp-evm.dts file. gpio-leds here shows that the leds are compatible with gpio-leds driver (/drivers/leds/leds-gpio.c). Default trigger of LED0 is heartbeat trigger which driver is found at (/drivers/leds/trigger/ledtrig-heartbeat.c). Default trigger of LED1 is mmc0 trigger which driver is implemented in the MMC driver (/drivers/mmc/). &gpio5 10 shows that the led is controlled by GPIO5_10 pin. GPIO_ACTIVE_HIGH shows that the GPIO pin pulls up when it is active. For pinctrl-single,pins part, let's take 0x240 (PIN_INPUT_PULLDOWN | MUX_MODE7) /* gpio5_10.gpio5_10 */ as an example. The pin attribute is found in the processor datasheet where gpio5_10 specifically, is in Table 4-10, on Page 38. When adapting GPIO functionality, the pin should be multiplexed in 0x7 mode. Its ball-reset-mode is Mode7 and it can take PULL-UP / PULL-DOWN IO types. There're 2 places to find the GPIO5_10 register address. In Table 7-11 CONTROL_MODULE Registers, in Section 7.3.1, on Page 647. In Section 7.3.1.190, on Page 987. Take a look at the pinmux definition found at am4372.dtsi. reg = <0x44e10800 0x31c>; tells us that all pin control registers starts from 0x800. Finally, the GPIO5_10 register address is calculated as 0x240 (0xA40 - 0x800). At last, we can now handle the turning off led D8 aim, and yet there're two ways to get it done. Step 1: comment out the [email protected]'s definition. Step 2: comment out the gpio5_10's default settings. * In `user_leds_default` and `user_leds_sleep`. Comment out `gpio5_10` default settings. Step 3: manually setup gpio5_10. Reference: In a device tree for AM335x, how do I know what pinctrl values to use?